Evenks in Yakutia coexist with civilization, lead a nomadic life with their deer and try to revive their native tongue. 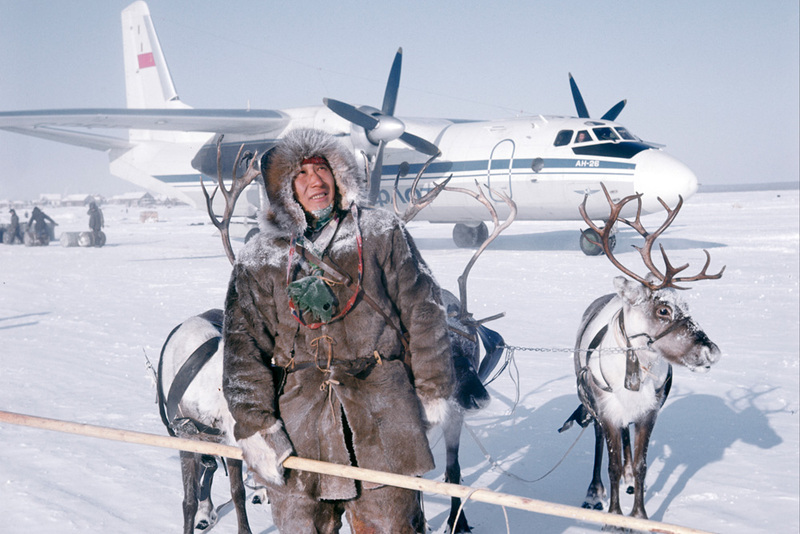 Planes from Yakutsk (5,160 miles from Moscow) fly to the National Ulus (district) no more than twice a week. Locals drive to the landing field to meet arriving relatives and everyone knows each other by sight. A newcomer is big news in every settlement and will be swiftly invited to tea – after all the Evenks are a hospitable people. The Evenk National Ulus is Yakutia's largest territorial unit. This land of reindeer herders is located north of the Arctic Circle in the northwest part of the republic. The four settlements of the Ulus have a population of 4,000. The only way to reach remote settlements or the city of Yakutsk from here is by driving along the ice road, passable only when temperatures fall below zero. Winter reigns here almost year round, with summer making a brief appearance in June and July. One of the settlements, Olenek, is connected to Yakutsk by an old An-24 plane. Why do Evenks speak Yakut? About 1,500 Evenks live in wooden houses in Olenek and Kharyalakh. Main supplies are purchased locally, while more sophisticated foods are purchased in Yakutsk. The basic supplies in an Evenk home are deer meat and fish. Jobs are scarce in the Ulus, so Evenks make money by hunting deer or wolves. There is no internet, but the school in Olenek is well-equipped, even featuring an ethnographic museum. The museum director, Prokopy Savvinov, gives tours. It took Evenks a while to become reindeer herders, but reindeer allowed them to lead a nomadic life. Today the Olenek Ulus has more than 4,000 deer. We ride a huge truck, which rocks from side to side along the ice road. The women sing Yakut songs. It takes us five hours to reach the herders' camp. Evenks take their rites and customs seriously. Local elders perform a rite called "chichipkan" to purify us and make a sacrifice to the fire by throwing bits of pancakes in it. You can talk to guests and show them the area only after performing this rite. We head for our tents where herders and their families sleep on reindeer skins. The camp is equipped with solar panels and nearly all families use smartphones, but traditional ways are maintained: Evenks cook on cast-iron stoves and sew traditional clothes, because it is the only way to stay warm in the tundra. "Our mother tongue has been preserved thanks to the nomadic lifestyle of reindeer herders,” Svetlana Stepanova, a teacher of the Evenk language, tells us. “Small groups of Evenks wandered far out into the taiga and kept their language musical and pure." Stepanova has been teaching in Olenek for many years trying to revive the Evenk language. In her Evenk class at the school, she uses textbooks and dictionaries that have recently been published. Kids love her classes. "The Evenks are a peaceful nation,” Stepanova continues. “They love deer and never kill one unless they have to. A slaughtered deer is consumed without waste: thus, hooves are used as a material for toys. My parents founded the department of the Evenk language at Ammosov Institute of Languages and Culture in Yakutsk. I have followed in their footsteps, dedicating my whole life to teaching the Evenks their native language."